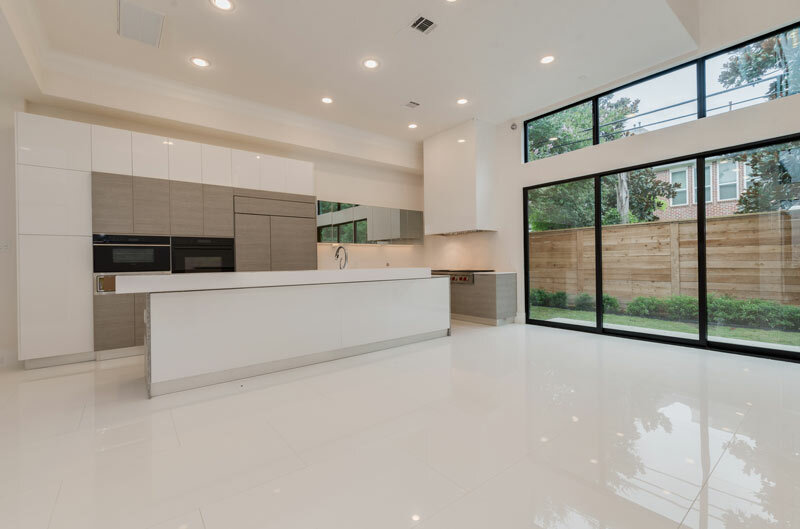 It's Houston Modern HomeTour Day! Doors open at 11am. Enjoy the day supporting local Houston architects and designers! 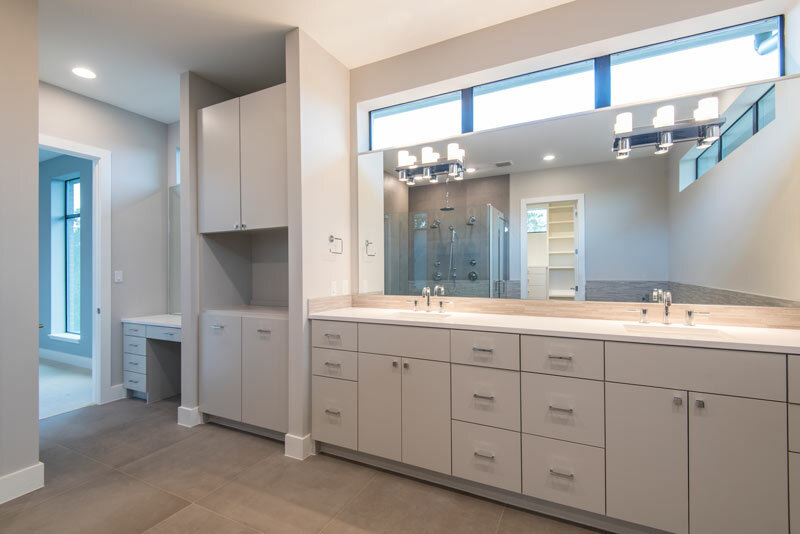 Presented by Builders West, Inc.
After their recently remodeled ranch-style home flooded in 2015, the homeowners of this modern masterpiece decided to design + build with On Point Custom Homes. The home, which is built five-feet off the ground, has a stunning brick and Cumaru exterior façade complete with iron railing. 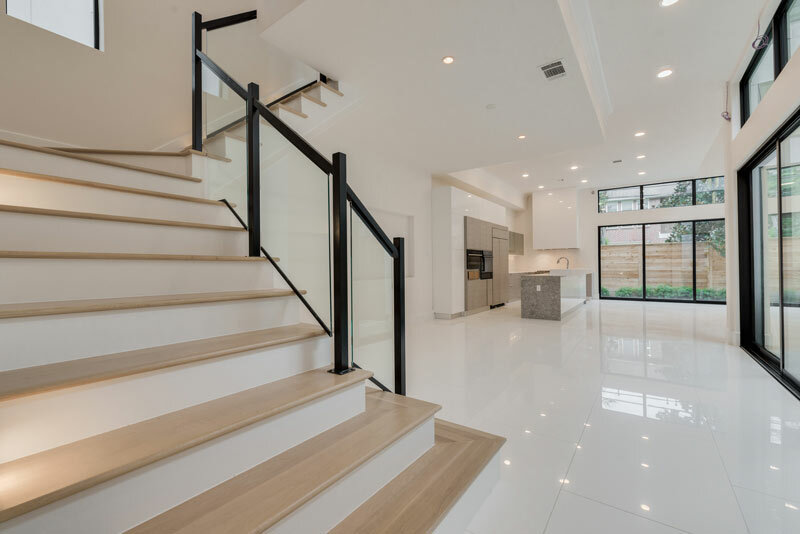 The 4-bedroom, 3.5 bath home features open kitchen, living and dining areas complete with access to their outdoor summer kitchen and a bar with a wine room. 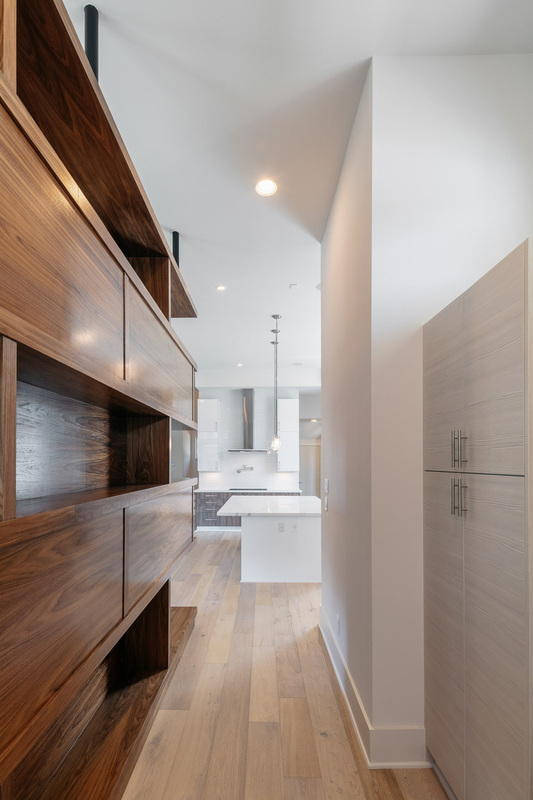 Gray flat front custom cabinets and gold hardware pair beautifully with the Neolith kitchen countertops, while the living room hosts modern floating shelves. 3D-like wallpaper welcomes you to the dining room and bold light fixtures throughout are stunning focal points. 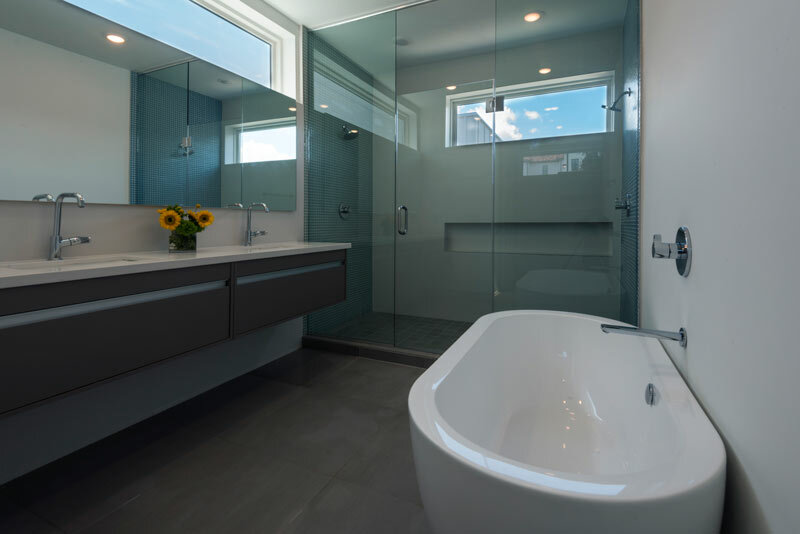 Upstairs the master suite features his and her walk-in closets, an expansive bathroom with freestanding tub, double glass pane shower and large custom vanity. A bright orange game room, navy-blue study with stunning windows and a kid’s room with green and blue stripes bring lots of color and personality to this family home. 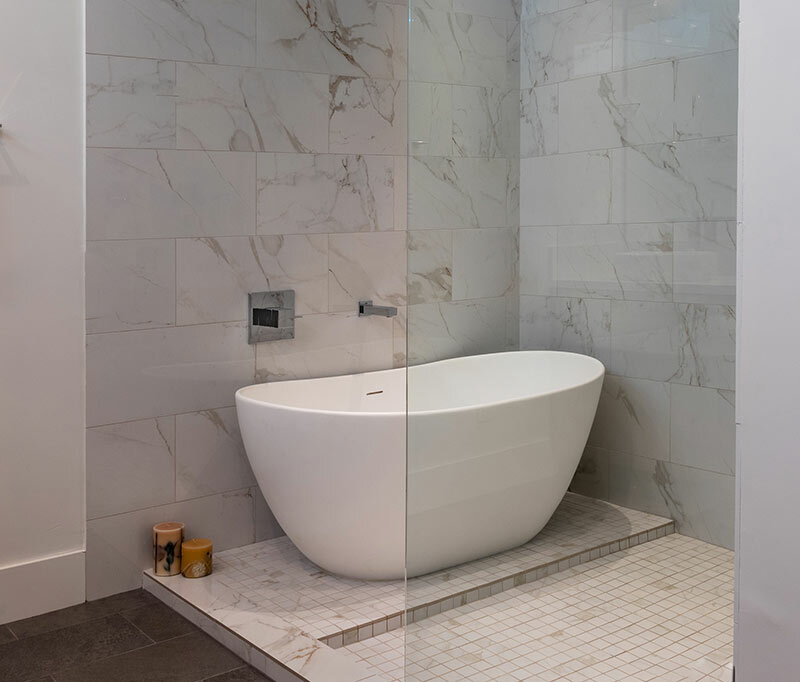 Photography: Courtesy of Builders West, Inc. 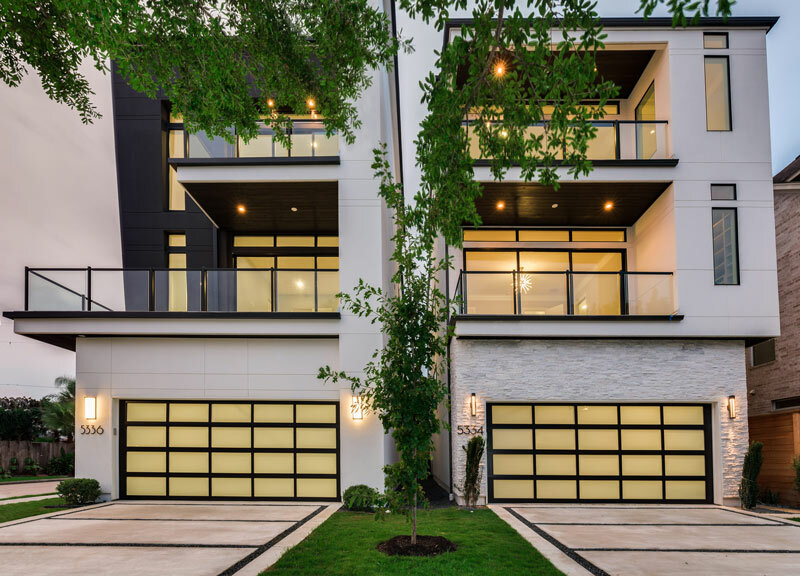 This stunning architecturally acclaimed contemporary residence by Price Harrison boasts elegant, well-appointed living spaces and designer finishes throughout. 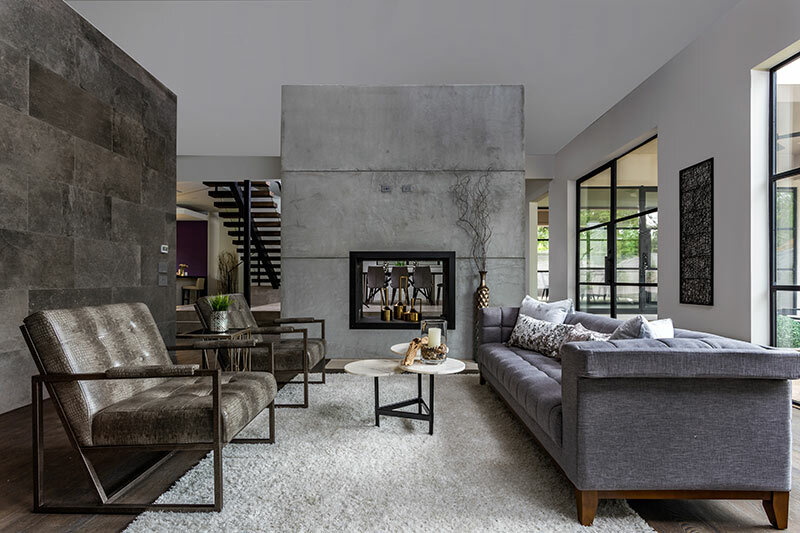 Built in 2005 by Kurt Lobpries (Builders West, Inc.), this fabulous West U home has been featured in Modern Luxury Magazine, Dwell and on the Rice Design Alliance Home Tour (2011). 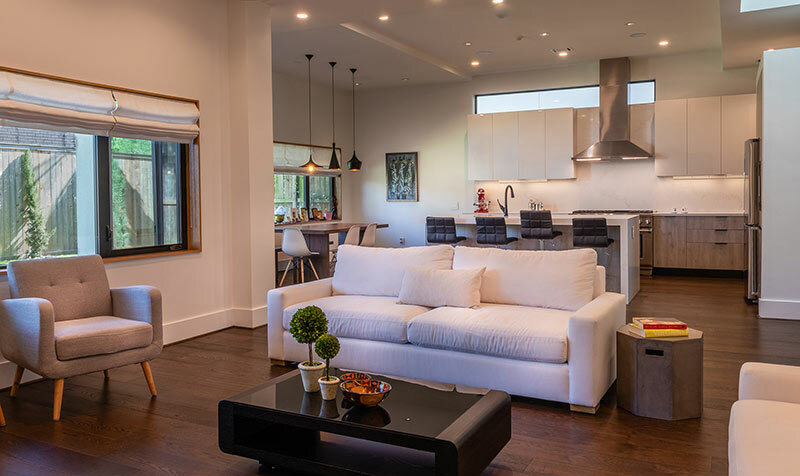 Floor- to- ceiling white steel framed window panels create a beautiful light-filled, open/airy atmosphere. 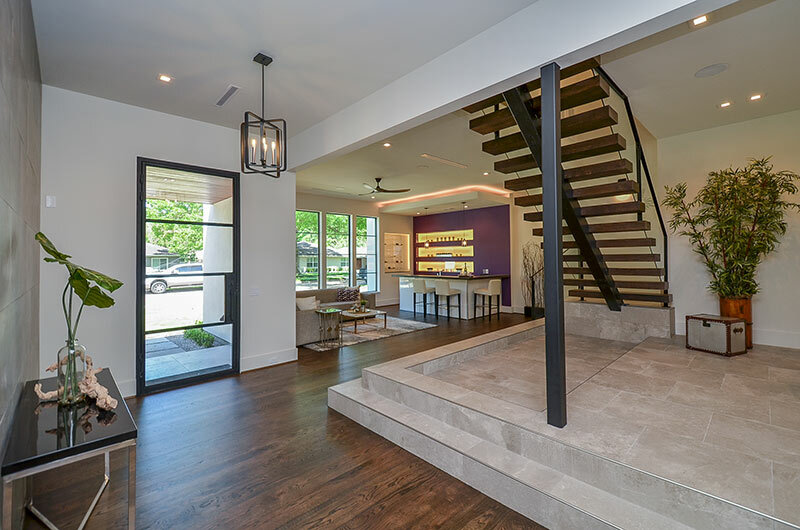 With 3 bedrooms, 2.5 baths, this open floor plan lives larger than its 2800 sf. 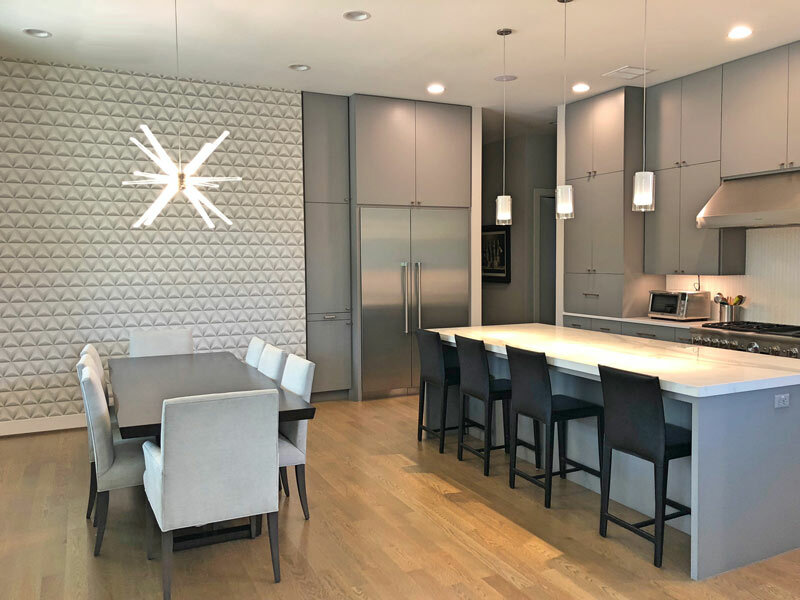 Special features include Canadian white maple hardwoods, Thassos Greek marble, custom cabinetry, stainless appliances (Bosch), Dornbracht and Franke fixtures, Lutron lighting. Gleaming pool is surrounded by Empire Blue flagstone and Tennessee limestone. Landscaping by Thompson+Hanson. 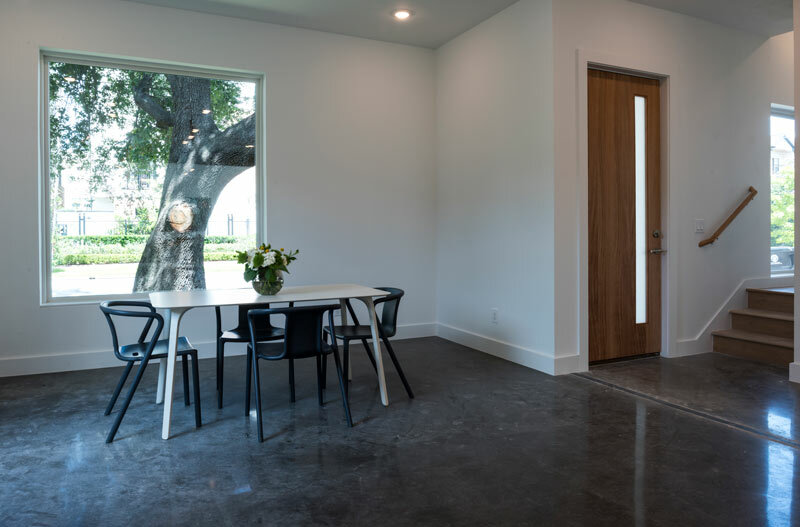 All in close proximity to Rice Village, the Medical Center and Rice University. 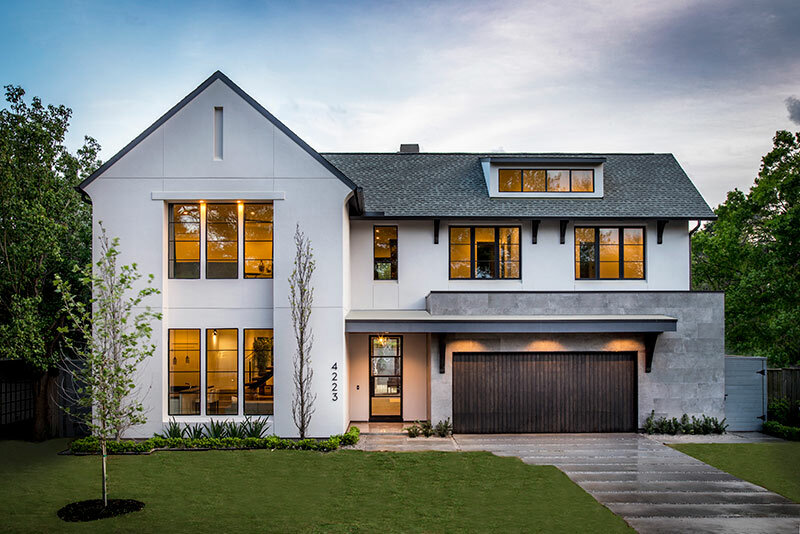 This Origin Architects’ designed major home renovation, located in the prestigious Tanglewood neighborhood of Houston, was originally built in 1997 with this most current renovation being completed in 2018. 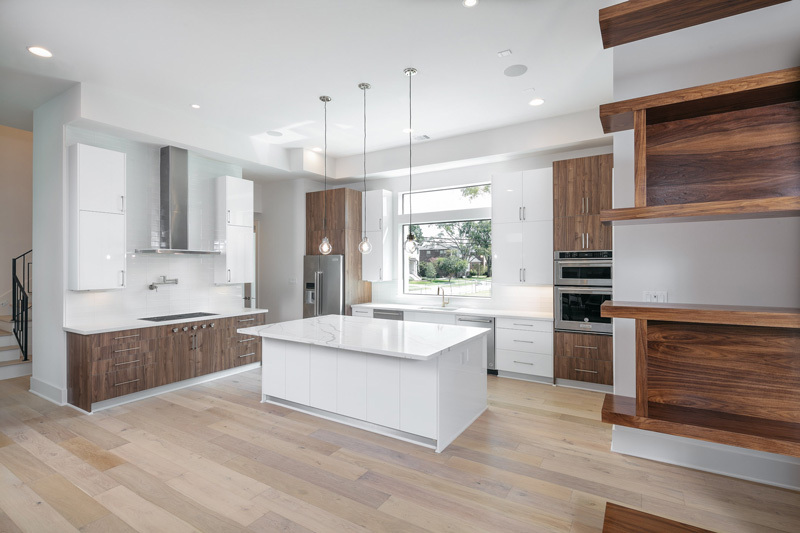 The exterior of this understated home, was minimally renovated, as to not clash with its very traditional neighboring homes. 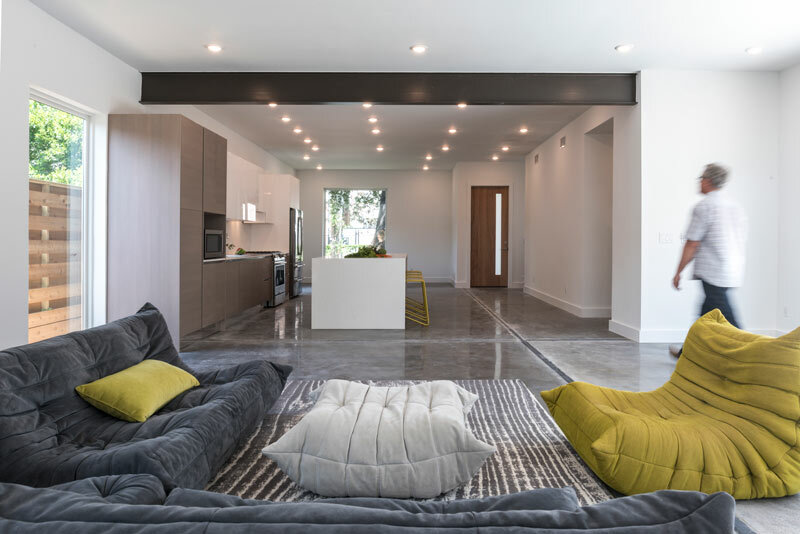 In stark contrast to this, its interior was renovated almost in its entirety, completing an interior metamorphosis into a contemporary and open floorplan. 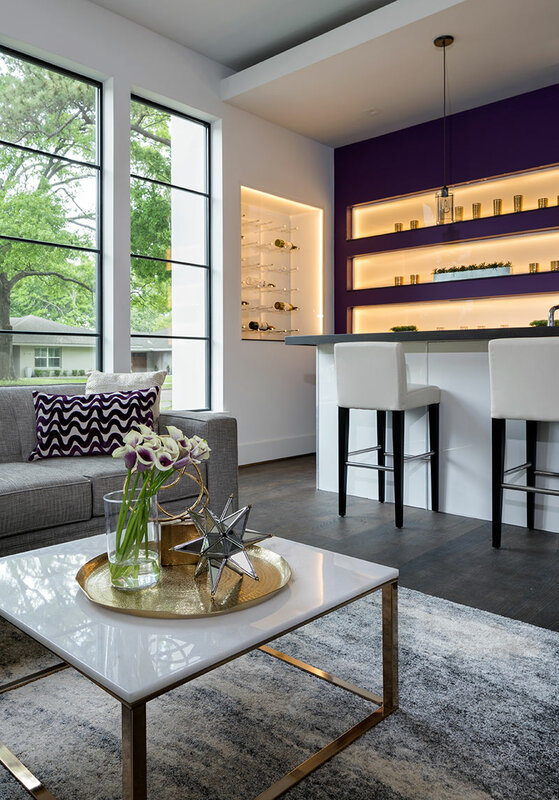 A perfect balance of contemporary and transitional touches was masterfully attained by Lucinda Loya Interiors, to the home’s interior design, to tie its clean contemporary lines with its more traditional exterior, and finally completing the original architectural vision with a careful selection of furnishings. LBJ Construction oversaw and coordinated the construction process seamlessly from beginning, coordinating pre-design discussions between BEC Engineers & Origin Architects up to the final stages, including the exterior landscaping and clean lined pool design provided by Dynamic Pools and Patios. 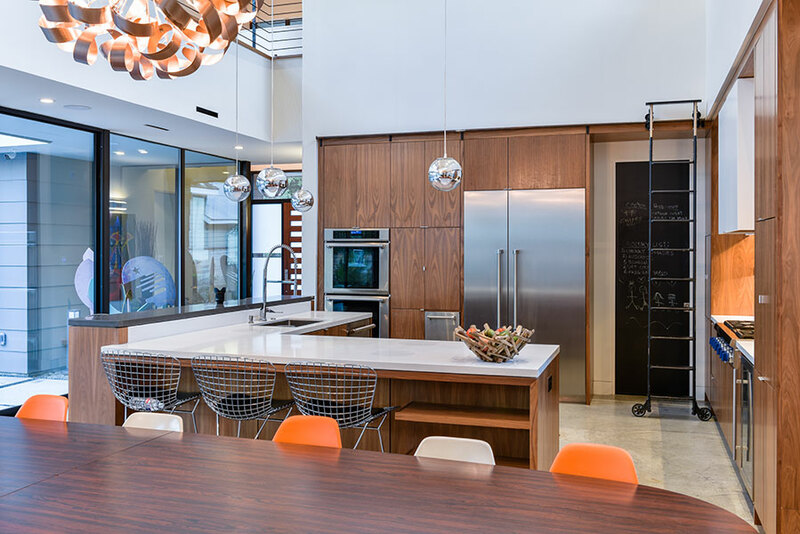 An urban retreat in Hyde Park, the 3,800 sqft home was design for a young. but growing family. 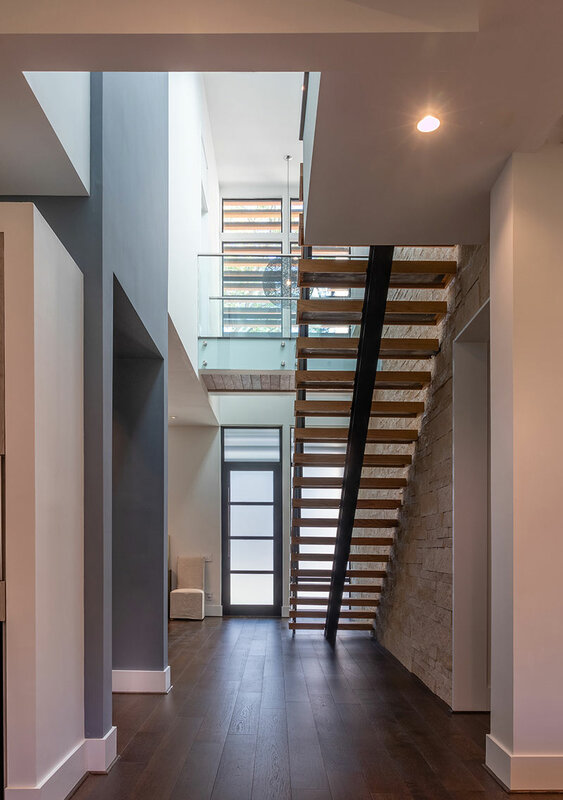 The double volume entry foyer, accented with a large skylight, stone wall and custom steel stair case is the “heart” of the home”. 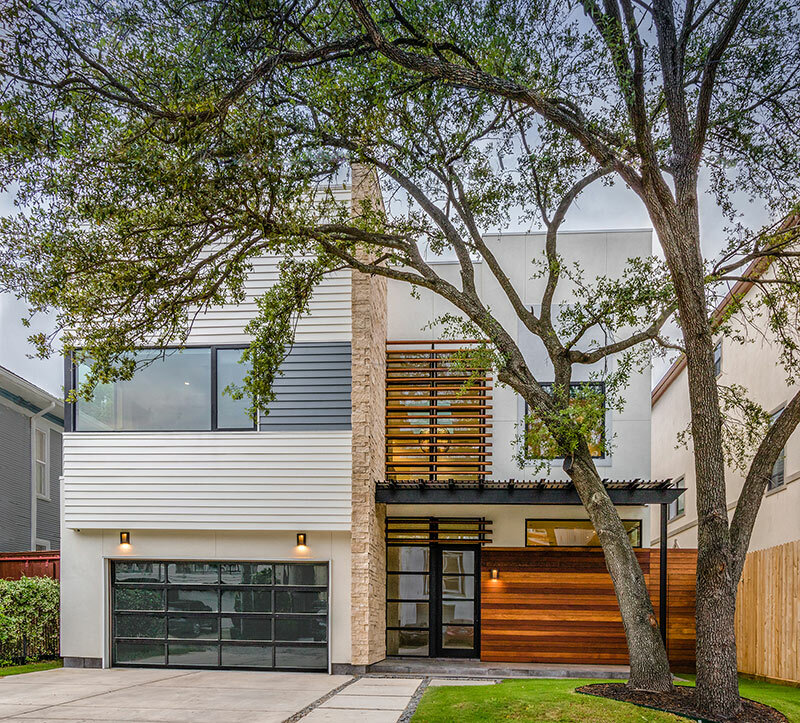 Long and lean, this home was designed for an urban lot in the heart of Houston minutes from St. Thomas University. The 3,810 sf single family residence has a sculpture courtyard and open concept living space with a view of the lap pool. 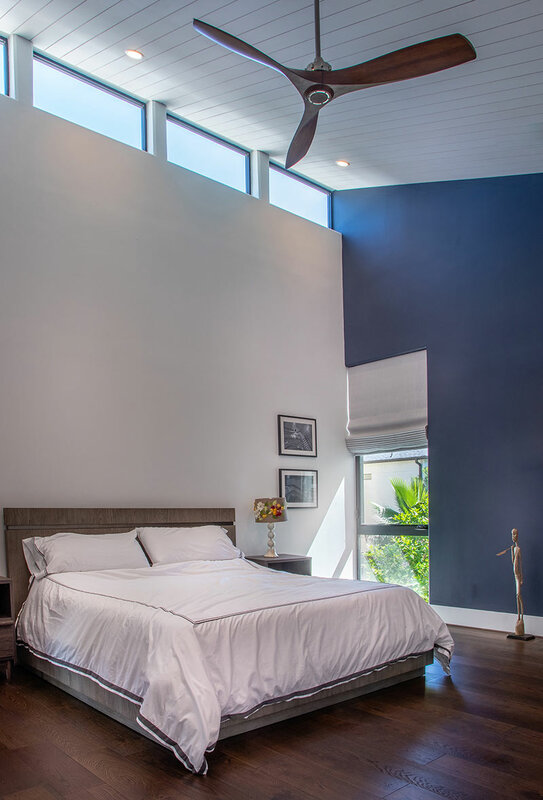 The massing of the project allows for a second floor master suite with a private balcony. 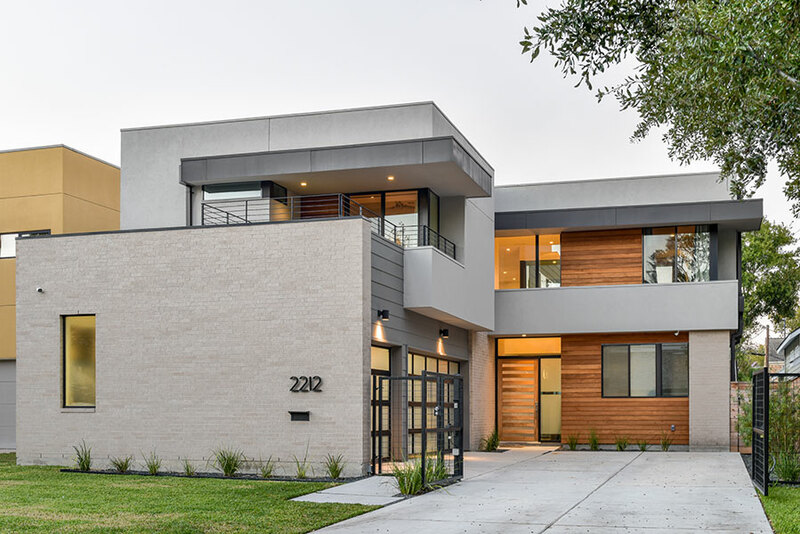 This Modern Urban dwelling, is a unique utilization a constrictive inner city property. 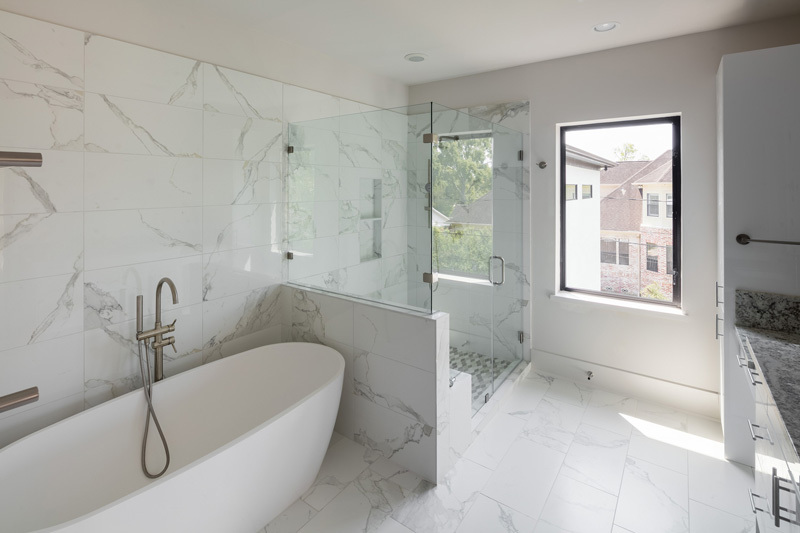 The use of natural light is vital to the organic relationship between interior and exterior spaces. 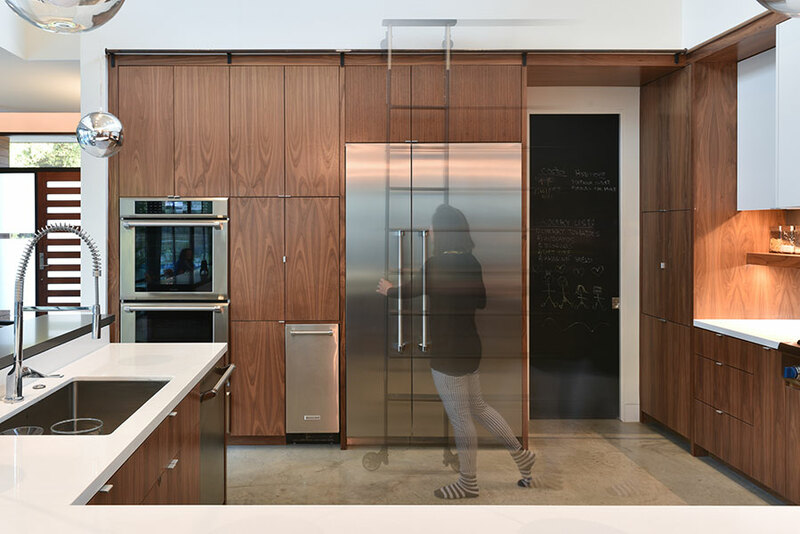 This concept is reinforced by large sliding glass doors, that open to an entry courtyard, a rear yard space (very rare for urban infill dwellings, and expansive balconies. In addition, the corner lot configuration allows for the aforementioned elements to wrap two sides contiguously. 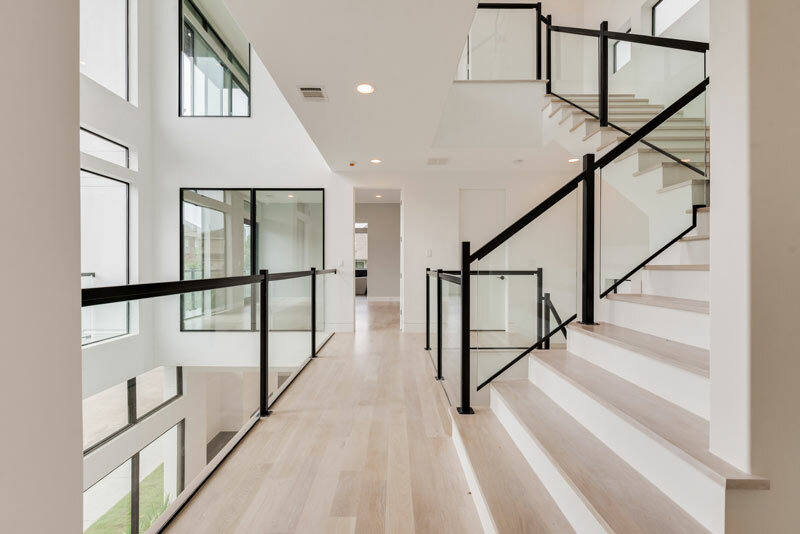 Spacially the interior entry atrium acts as a vertical spine of natural light, that intergrates three levels of circulation. The first level of the atrium will have an interior garden that opens to the entry courtyard. The interior garden is intended to be a focal gathering meditation space/entry parlor. 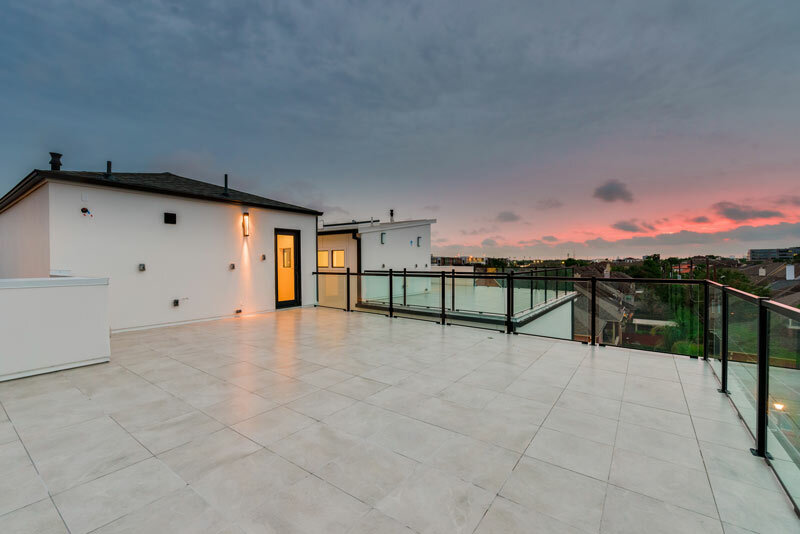 Multiple balconies and a large roof terrace allow for incredible views of the neighborhood and the Galleria. 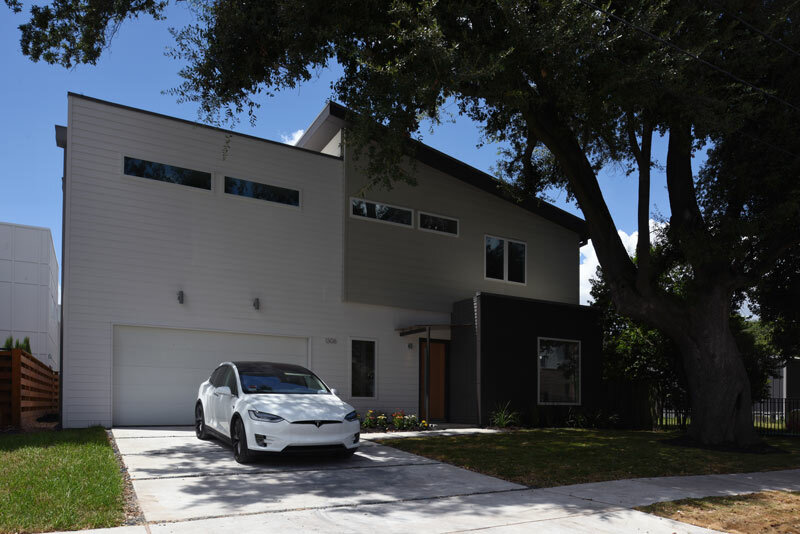 This home is the first prefab construction in Houston built on a moveable concrete foundation system. 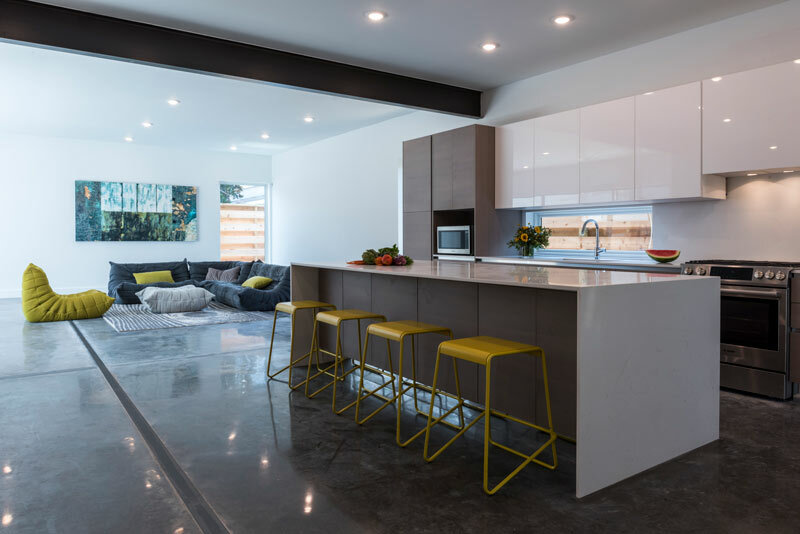 The home was constructed using off-site prefabricated modules built on the foundation and delivered and set in place. This system offers increased quality, speed and reliability in the construction process. 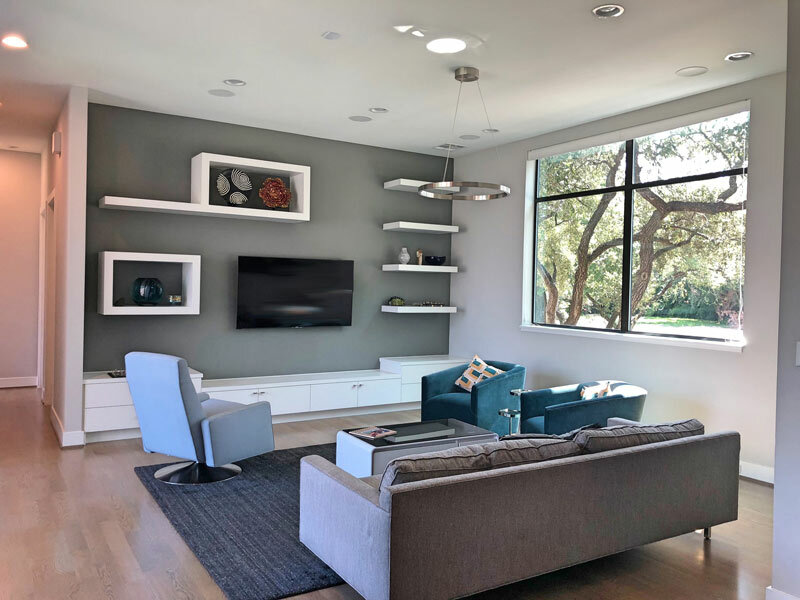 The design by award winning Intexure Architects for Context Homes is a great example of smart design solutions optimized for today’s lifestyle. As a two story home with a compact footprint it preserves outdoor areas in the backyard and features a second floor terrace. 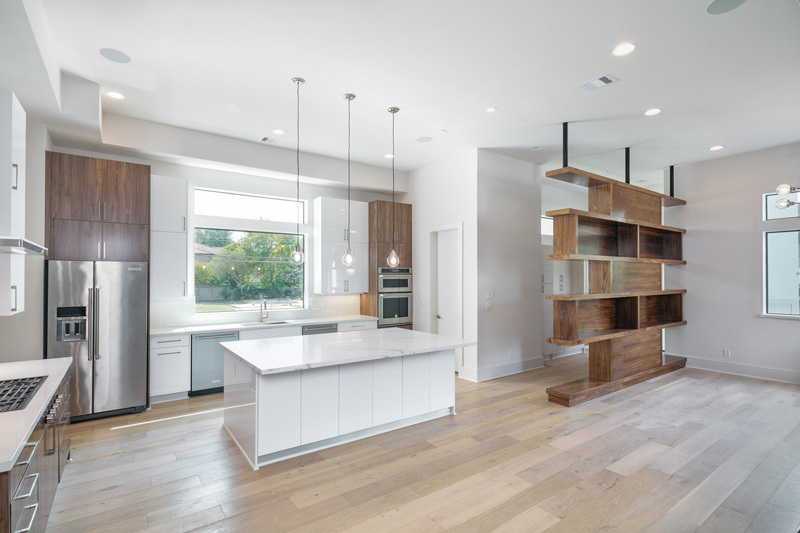 The kitchen is the center and heart of the home connecting open spaces and natural light. This unique prefab process provides good design and modern sustainable homes in an approachable, timely method. 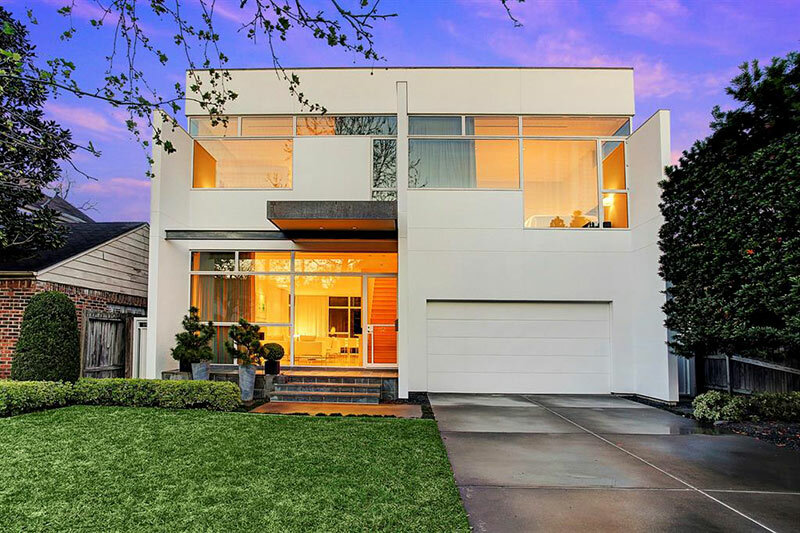 This brand new modern masterpiece is a vivid demonstration of the contemporary form and function modern families demand. 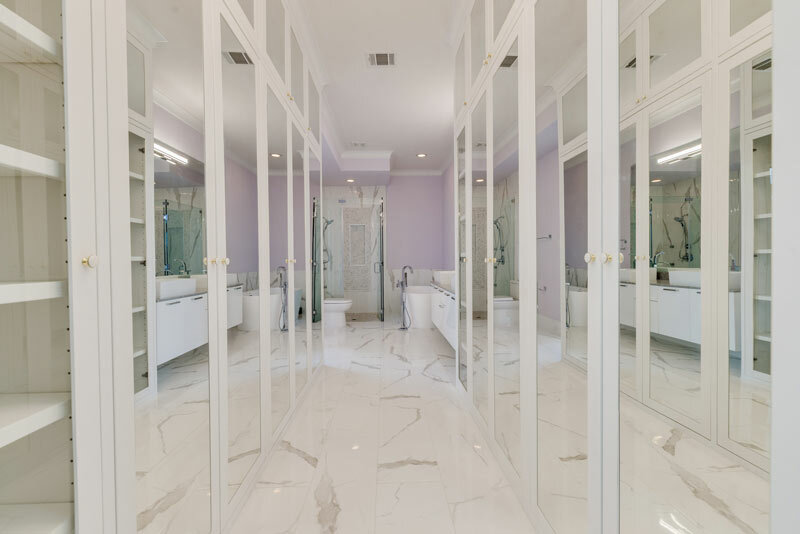 The home is 5,049 square feet and has 4 bedrooms plus 5 full baths. It also has a study that can become a 5th bedroom and even a separate suite with it’s own bath. 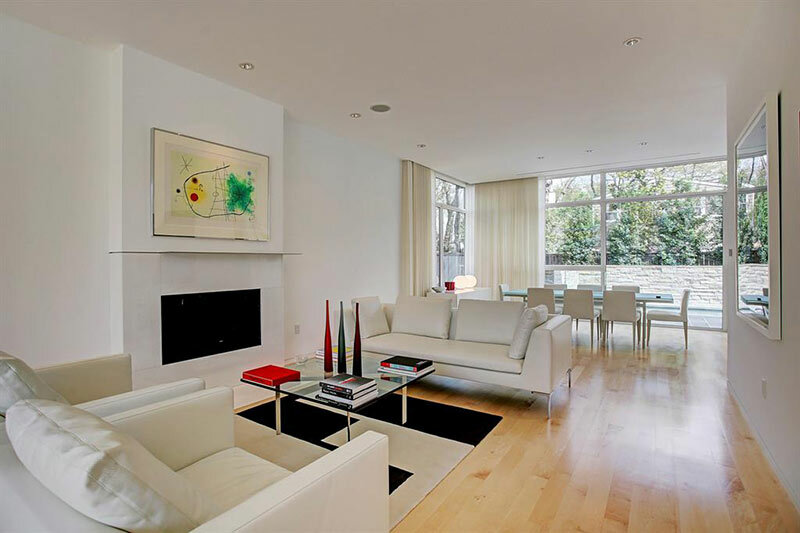 There are soaring ceilings and large steel and glass windows at every turn which leads to lots of natural light. 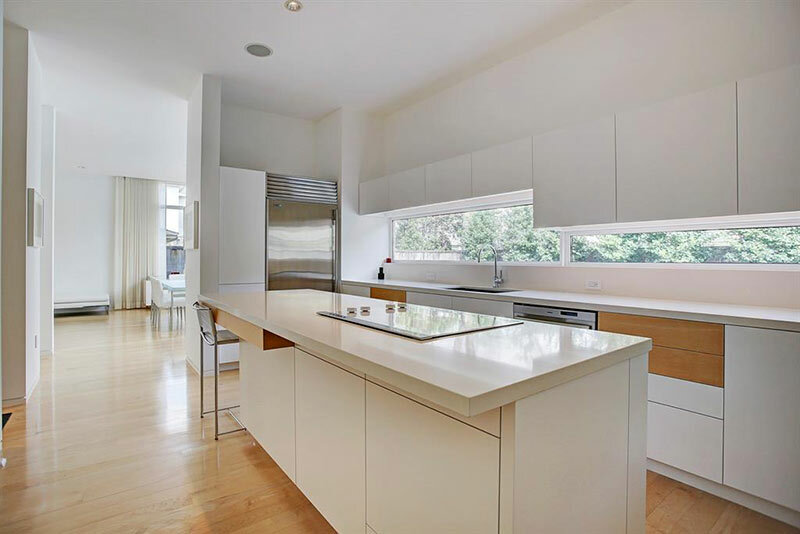 This home is designed to be as comfortable and functional in your daily life as it is for entertaining larger parties. 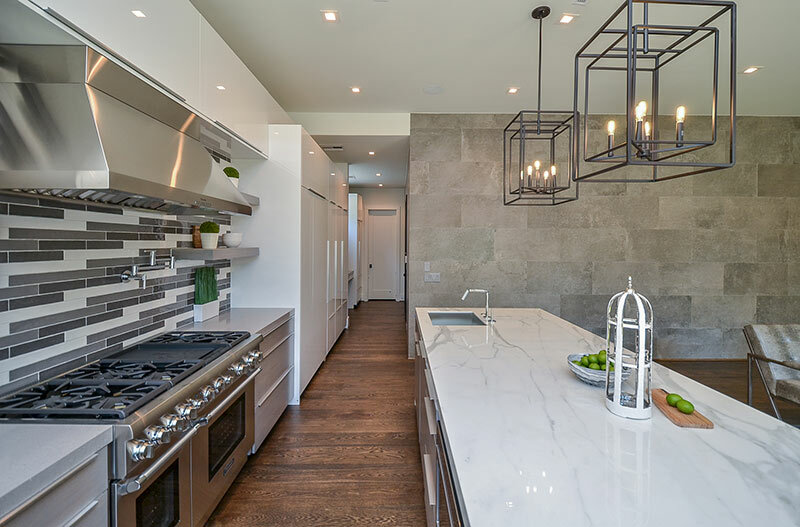 The dream kitchen is equipped with Thermador appliances and numerous other touches that will please the gourmet in your family. 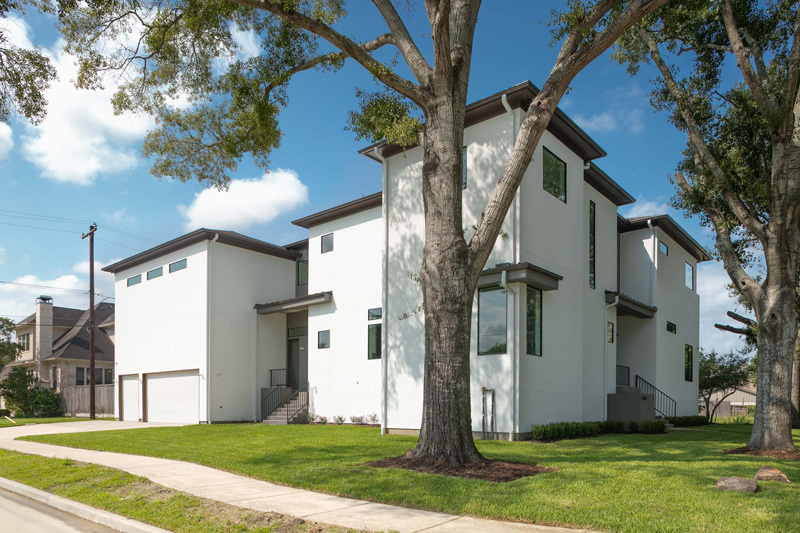 Situated among the mature trees in the exclusive neighborhood of Lynn Park, the home is within walking distance of Highland Village and minutes from Houston’s most dynamic dining, shopping and entertainment venues. 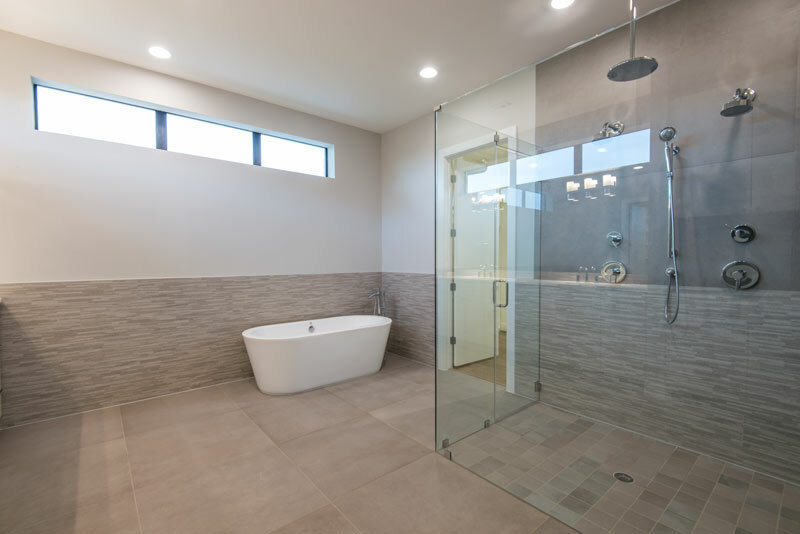 It is also elevator capable and the builder has included plenty of built in storage throughout the home.